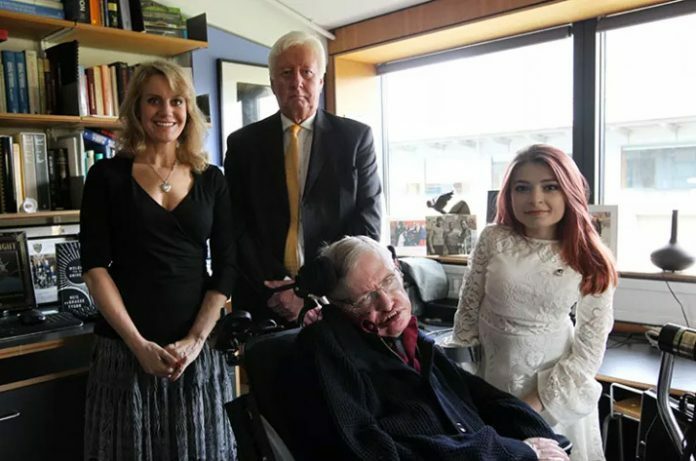 It was indescribably wonderful to have the opportunity to sit beside Professor Stephen Hawking and tell him about what we are fighting for in Hollywood, which is, the inclusion and employment of people with disabilities in Entertainment. Performers with any kind of visible or audible difference have been almost completely left out of this industry, even when there is a role about that challenge. There is so much fear in the world regarding disability that leads to bullying, discrimination, extreme poverty and isolation throughout the entire lives of people with disabilities. It is unfathomable to me that we continue to allow this inhuman response in our evolving world. But our industry has the ability to change this immediately, by changing perceptions. I believe that when people with disabilities are fairly and accurately represented in film, television and advertising, the entire world will become more accepting and inclusive. Until we include this community, on a regular basis, we are cheating all audiences of a complete and deeply human experience. We may just be excluding our world’s greatest problem solvers, thinkers and game changers from society. To sit beside Stephen Hawking, to look into his eyes, with my hand on his arm, and share my passion for this cause, was an experience I will never forget. After we talked, I could not help but notice that his eyes were fixed on me until the very end of our meeting. The compassionate and soulful look in his eyes touched my heart. It felt as if we connected in such a profound way that I don’t even know how to explain it. I just felt it and it stuck with me. Sometimes a real human connection and understanding cannot be accurately described with words. Perhaps one day, I’ll be able to share it on film. Indeed it is a sense memory I will use in my work, for it is rare to ever connect on such a level with any human being. They say “a look says it all”. Now I can say I’ve truly experienced the open window to someone’s soul. I hope that sharing what we are trying to accomplish with arguably the world’s most renowned person with a disability will help us get through to people who have the power to make these changes NOW. Professor Hawking is highly respected and sought after by the very people making most of the decisions in Hollywood. They made a story about his life. He has great influence, and if he speaks for this cause, people will listen. Imagine if society had put Professor Hawking in a corner and blocked his contributions to the world? Or Helen Keller? Beethoven? Stevie Wonder? Wilma Rudolph? Franklin D. Roosevelt? We can’t allow that isolation for any human being with a disability. Imagine all the brilliance and talent our world is missing out on from excluding this large segment of our society. Changes are happening, but they are slow. We need more people of influence supporting this movement toward an all inclusive society. Professor Hawking’s voice on this matter could move mountains and open minds globally. It was such an absolute pleasure to meet Mr. Hawking. An experience that has changed me forever.